Uglyworld #771 - Exploring The Wilderness (255/365), originally uploaded by www.bazpics.com. 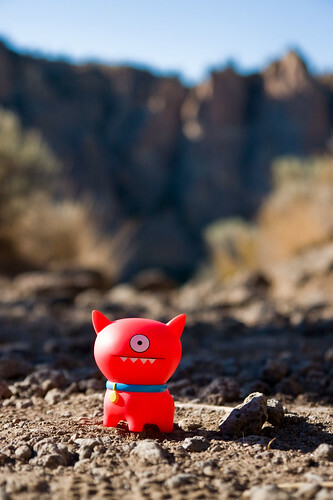 While Babo was busy scaling the cliff-face of Smith Rock, Rolf was off doing some exploration of his own. He had overheard people talking in the car park that they had seen a Golden Eagle nest a little distance from one of the trails, so he set off as fast as his little legs could carry him to find one for himself to say hello to. Unfortunately he didn't manage to find any Eagles, but did explain to us later that he had managed to meet several lizards along his travels.